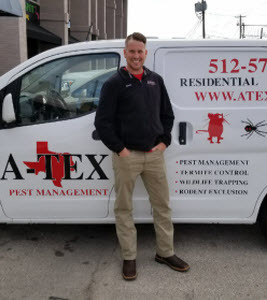 Welcome to A-Tex Pest Management, the premier choice for Greater Austin, Texas pest and termite control as well as rodent and wildlife removal services. Texas is home to many different species of insects, rodents and wildlife. A-Tex Pest Management is locally owned and operated and we know our Texas pests! We will not only solve your insect or termite infestation problems as well as trap and remove rodents and nuisance wildlife, but we also offer wildlife exclusion and the necessary repairs to prevent new pests from taking up residence. We provide expert residential, commercial and industrial pest control services and custom pest solutions for homes and businesses in Bastrop, Hays, Travis and Williamson counties. Termites Are Officially Swarming! In Response, We Are Offering FREE INSPECTIONS! We are fully licensed and insured and have been serving our clients in the Greater Austin area since 2002. Our seasoned technicians have over 30 years of experience and are eager to share that knowledge and expertise with you! Our exterminators are trained in the latest pest control products, techniques and technologies so you know you are always getting the best pest service available. We have many satisfied clients that can attest to our quality of work and how helpful and friendly our pest technicians are. We will carefully listen and respond to your questions and concerns. A-Tex Pest Management are here to help rid your property of existing pests and keep them from returning in the future. Contact us today for a free consultation. At A-Tex Pest Management, we offer pest control services to help eliminate termites, bed bugs, pantry pests, ants, cockroaches, spiders, rodents, wildlife and many other pests. We provide a program of protection for all types of homes from apartments and condos to single family homes to fit the needs of every customer. Rest assured that no matter your pest control needs, we have pest control solutions tailored to your specific circumstances. Pests not only physically damage the structures where you work, they also damage your reputation. A-Tex Pest Management offers complete Integrated Pest Management Services for commercial and industrial locations. We service apartment buildings, food processing facilities, office buildings, schools, medical facilities and many other types of commercial properties. Our highly qualified and experienced technicians can inspect your facility and make recommendations for the elimination and control of any type of pests you may be dealing with. After all, you want potential customers to hear about the quality of services you provide; not that you have a cockroach infestation or a rodent problem. We are so confident in the effectiveness of our pest control services that we offer a 100% guarantee that we will solve your pest problems. Effective pest control requires a continuing service program of pest treatment and monitoring but if you do experience a pest problem in between visits, A-Tex Pest Management guarantees to provide additional pest control visits at no additional cost to solve your pest problems. In regards to wildlife removal, we have a 100% re-treatment annual renewable warranty as well. If pests are bugging you, A-Tex Pest Management can help. Call today for a free quote! Whether you hear scratching or the patter of little feet, or you see rat droppings or even worse an actual house mouse dart past you in the kitchen, A-Tex Pest Management can help! We will not only trap and remove the rodents for you but we also offer rodent exclusion to help prevent any future mice or rat infestations.